Circular light sources provide 360-degree lighting for shadowless macro photography, microscopes, and magnifying desk lamps. The target object is viewed through the center of the donut-shaped lamp. All-around illumination is needed for close-up work because normal room lighting is blocked by the viewing instrument or the viewer’s body. Circular fluorescent bulbs are relatively bulky and fragile, so they are only appropriate for larger devices in which vibrations and collisions are unlikely. Cold-cathode tubes and fiber optics with acrylic lenses are good choices for smaller devices, but are fairly expensive (usually more than $100). With the advent of high-output, relatively-inexpensive white LEDs, it is possible for a hobbyist to make a miniature solid-state ring light with surface-mount technology. 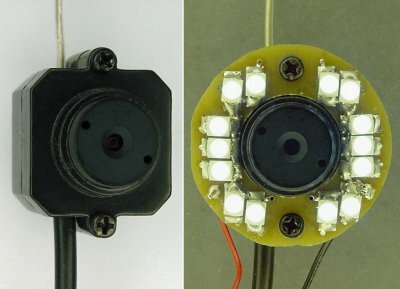 The LED ring light featured in this article costs about $10 in parts (PCB, LEDs, resistors, wire, and solder). If you’ve never tried soldering surface-mount parts, this is an excellent project to start with. Soldering instructions appear on the third page. 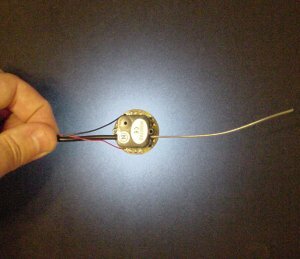 The dimensions of an LED ring light consisting of surface-mount components on a double-sided circuit board. 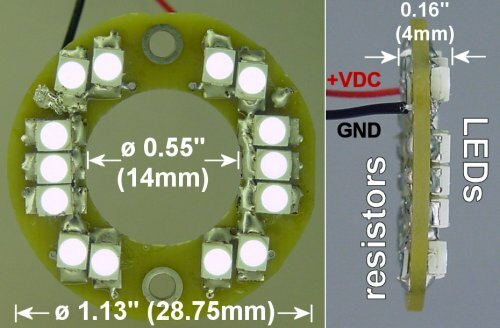 The LED ring light consists of a double-sided printed circuit board (PCB) with current-limiting resistors on one side and 14 white LEDs on the face. It is slightly larger than a U.S. quarter. The ring light operates on voltages of 3 V or higher, with 280 mA peak total current. In practice, much less current is used (usually 140 mA or less) because the light is fairly intense. This LED ring light has a 1.13 inch (28.75 mm) outer diameter, 0.55 inch (14 mm) inner diameter, and 0.16 inch thickness. 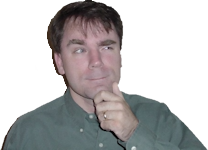 The inner and outer diameters are a little peculiar, as the light is designed to fit on a specific wireless video camera for my miniature robots. Of course, you can choose to make your LED ring light a different size. Wireless video camera with an LED ring-light attached. The tiny wireless pinhole video camera is model JMK-WS-007AS. It was purchased on eBay for less than $50 w/shipping. Interestingly, after the sale completed, the auction was retroactively canceled by eBay because this model includes a microphone -- which would violate eavesdropping laws if used as a spy camera. That’s sort of silly, since wireless camera phones and non-wireless video cameras include microphones and they aren’t illegal to sell. But, I understand eBay is doing the best they can to keep things honest and ethical. Since I use this wireless camera to record onboard views and sounds of mini-sumo robots battling, there is no real problem. The LED ring lamp mounts to the camera body using the existing case screws. A potential concern is that the screw hole locations would result in an uneven light distribution. Light distribution of LED light ring. Surprisingly, the moderately-wide emission angle (>100 degrees) and integrated diffused lens of each LED, combined with the large quantity of LEDs, results in an evenly-distributed light output. Other than the expected brighter center, there aren’t apparent hot spots or dead spots. Recall that the LED ring light dimensions were designed for a single wireless video camera. To avoid wasting the remaining copies of the ring light circuit, I needed to find a compatible use for the extra two ring lights. Loupe magnifier with LED light ring. 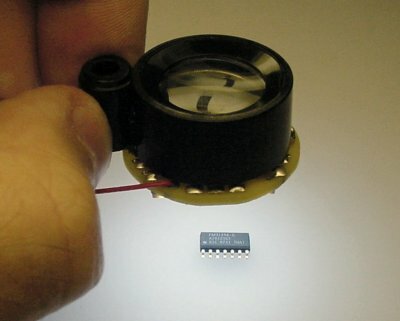 A magnifying loupe is often used for inspection of soldered circuit boards and for examining small parts. At such short distances, it is difficult to light up the subject. Attaching a spare ring light to a 10x magnifying glass makes it easier to spot flaws and read tiny part numbers. The lamp can be powered by a lithium polymer rechargeable battery (3.7V nominal voltage) held in your hand, or it can be powered by a bench power supply. There is no doubt that the third and final extra LED ring light will find a useful purpose. Perhaps on a milling machine? How the printed circuit board is optionally cut into a round shape. How surface-mount resistors and LEDs can be hand soldered to a circuit board. And, how the LED ring light is mounted to the magnifying glass.